"Some people believe you can't have a birthday without a cake but I think you can't have a birthday if you don't have candles to blow out and make a wish". 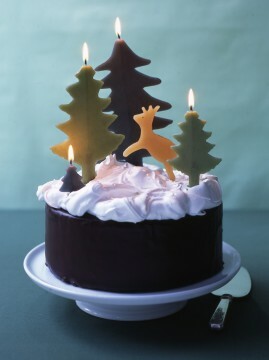 As it turns out, putting candles on birthday cakes is a tradition that has been around for centuries. It has been traced back to the Ancient Greeks, who often burned candles as offerings to their many gods and goddesses. In Germany, mainly for religious reasons, people would place a large candle in the center of the cake to symbolize “the light of life”. Scholars also say that the custom of placing candles originated because people believed that Gods lived in the skies. They thought that lit candle helped to send signals and prayers to the god so that they could be answered more effectively. Even today people hold a lot of superstitious beliefs about birthday candles. The person celebrating his or her birthday makes a silent wish while blowing out the candles on the cake. It is said if the person is able to blow out all candles in one breath it signifies that the wish would be answered and that the person would enjoy good luck in coming year. However, if the person reveals their birthday wish it will never come true. I've to say from all the crafts at the Martha Stewart website, this is by far my favorite one, mainly because of it's history and meanings among different cultures. I also love this project because it's so ridiculously simple that even a kid can do it. I love the idea of baking cake, covering it with chocolate ganache or anything you wish and creating a scene with your own customized birthday candles. Seriously, you will have the cutest cake in town if you are able to pull it off. These candles are also great for Valentine's day. Can you imagine? It would look so pretty. Is the little touches that count and make things special. 1. 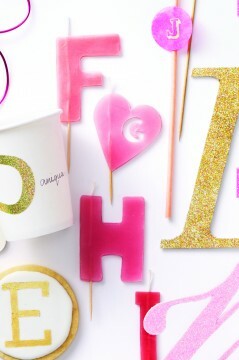 For each candle, cut out 4 of the same letter from beeswax sheets, using cookie cutters. If the wax is hard to handle, soften it using hair dryer (on low). 2. Make 2 stacks of 2 letters. 3. Press a toothpick vertically into 1 stack. 4. Vertically press in the end of the candlewick above the toothpick, so the toothpick and the wick meet. 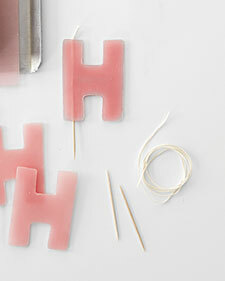 Trim wick to 1 inch above the top of the letter. 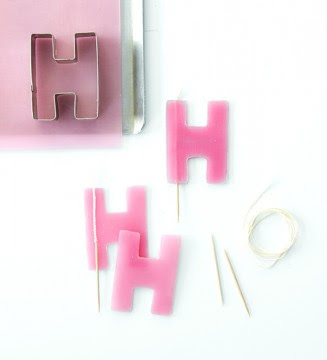 Press second stack of letters down on top, sandwiching toothpick and wick between them; press to join the stacks of letters together.